This place could hardly be any more Melbourne – down a CBD laneway AND in the basement. It’s also destined to be a smash hit. Nat and I have made it soon after opening hour on opening day and we’re joined by many similarly enthusiastic in-the-know food fans. 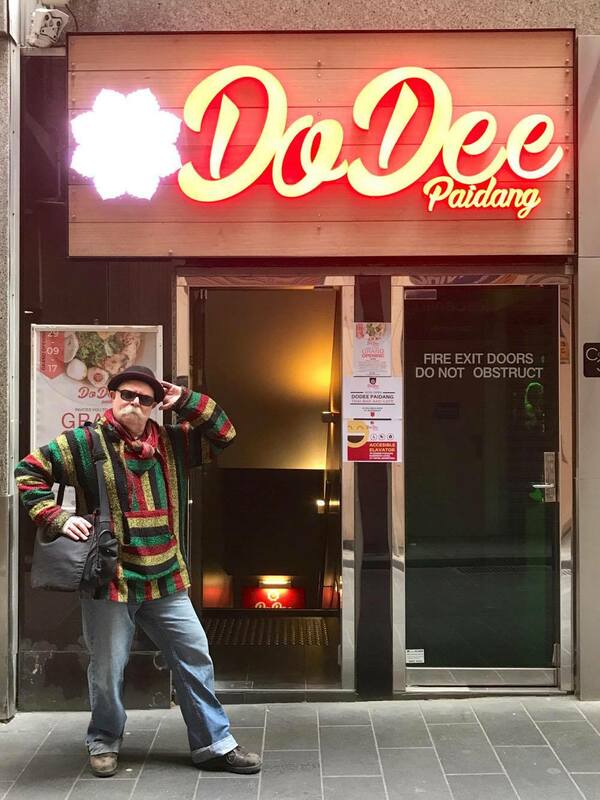 Dodee Paidang is a very welcome Melbourne outpost of a Sydney operation that already boasts three outlets – see website and menus here. 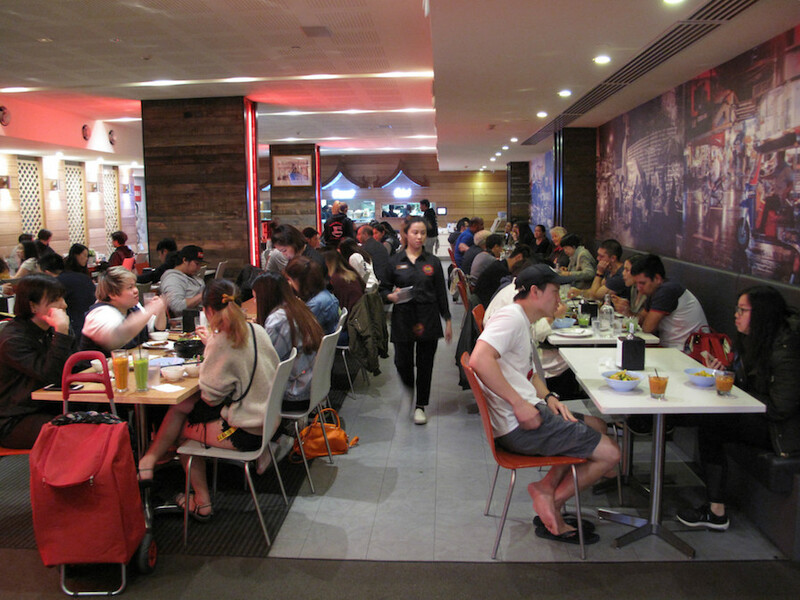 Here you’ll find all your usual Thai staples as found in eateries across Australia – pad thai, satays and so on. But if that’s the sort of thing you want, you may as well stay closer to home. Because the main action here not on the orthodox menu, but instead on the big street food menu. 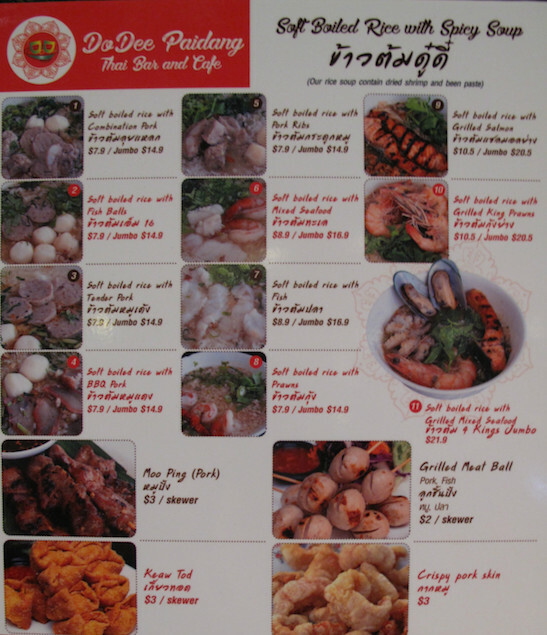 One one side are a range of “soft-boiled rice with spicy soup” offerings. Nat – far more of an expert on real-deal Thai food than I – tells me these are something like a cross between a regular rice dish and congee. But they’ll have to await another visit. 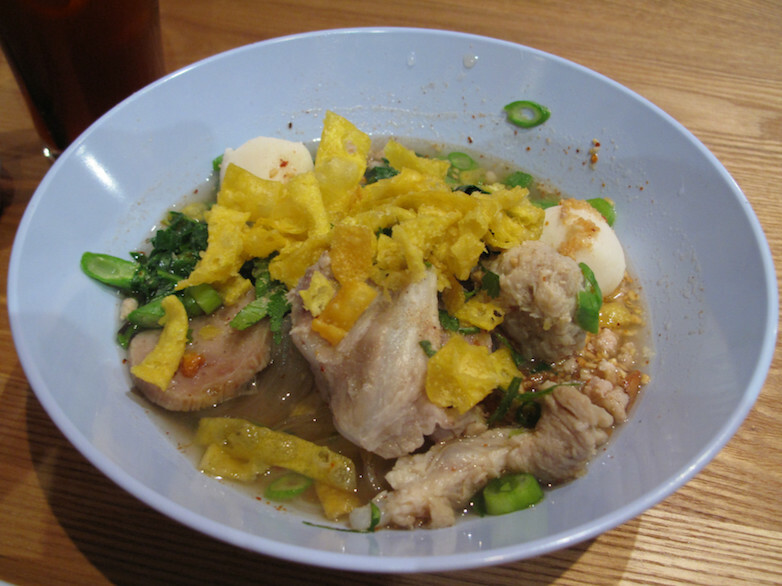 We both go for variations on the theme paraded on the other side of the street food menu – noodle soups. 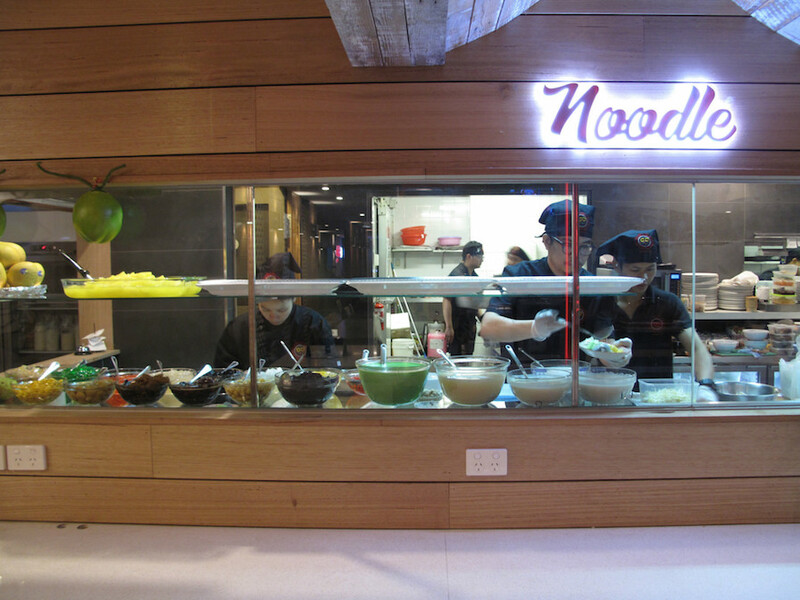 There’s a choice of seven different types of noodles and many different options when it comes to other protagonists. My own “Super MaMa” (jumbo, seen here, $16, regular $8.50) is a treasure festooned with crisp shards of wonton pastry. Built on a base of squiggly wheat noodles, my super soup contains some good-quality seafood (calamari, prawns and a couple of fish pieces – I don’t inquire as to the species of the latter). But the main thing here is the broth. Nat tells me our meals are pretty much exactly like what he’s enjoyed on – yes! – the streets of Thailand. 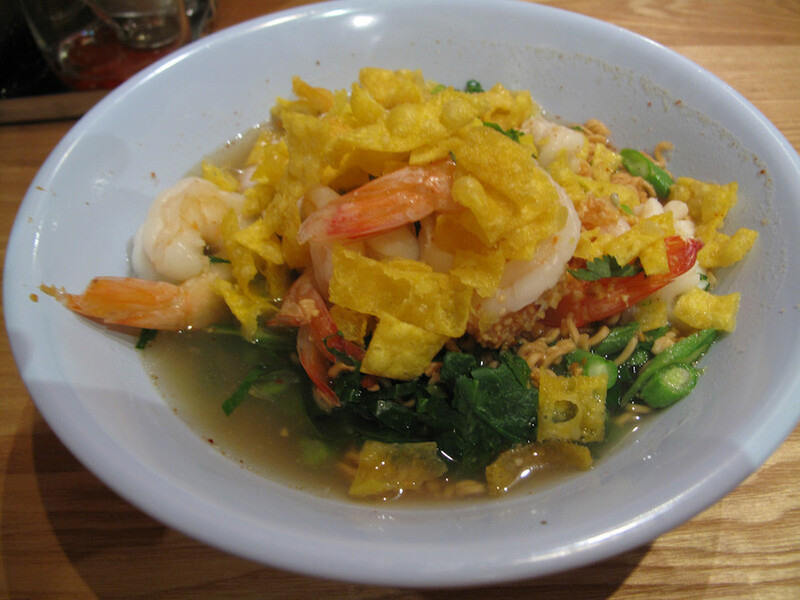 The broth is tom yum – but not as is served in most Thai restaurants in Australia. This is less heavy on the lemongrass; it’s nicely sweet and has a citrus vibe going on. And – this is the best bit – the flavours merge and improve and become more intense as I consume, so the last couple of mouthfuls are the highlight. Nat goes for a meaty dish with rice noodles and is equally happy. His regular Do Dee Variety – tom yum noodle with combination meat – costs a profoundly cheap $7.50. 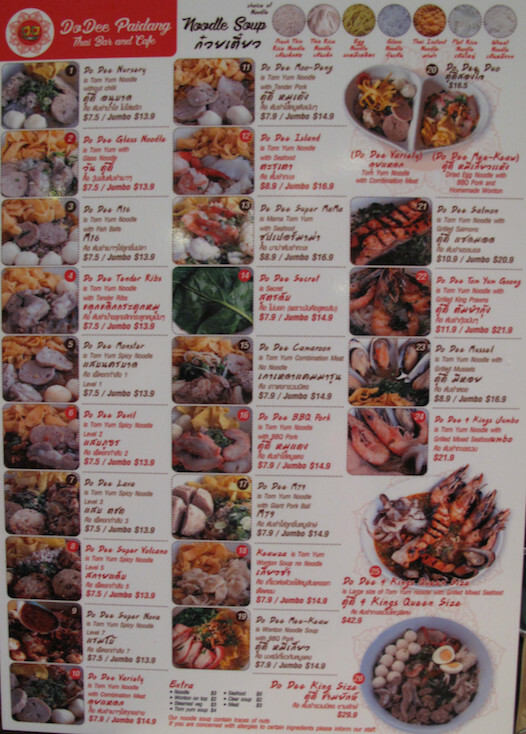 In there are two kinds of balls, meat and seafood, as well as chicken and pork. 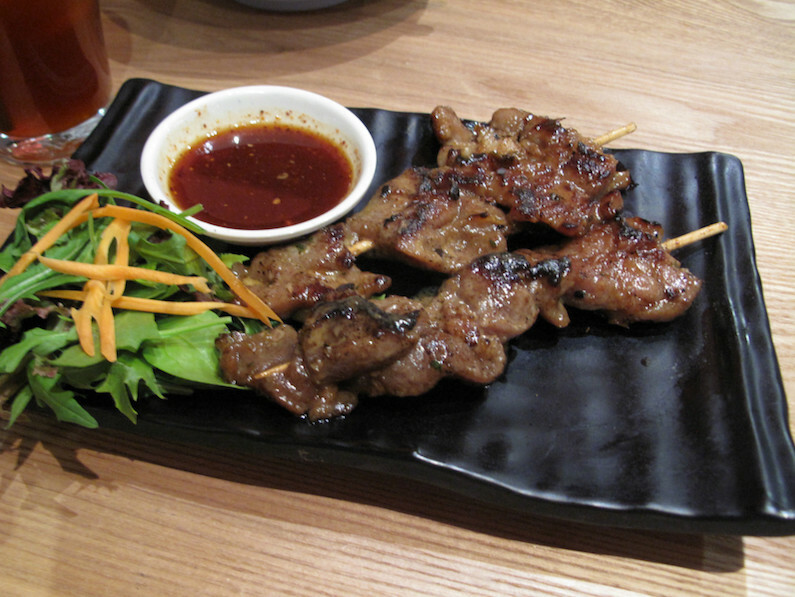 Just for variety’s sake, we get a couple of moo ping pork skewers ($3 each). I reckon they’re ace; Nat’s verdict is that they lack the desired, smoke, chargrill flavour. But … that’s a minor quibble. We suggest you hustle down to Dodee Paidang with haste. And before the hordes drawn by the inevitable coverage in the likes of Broadsheet descend. 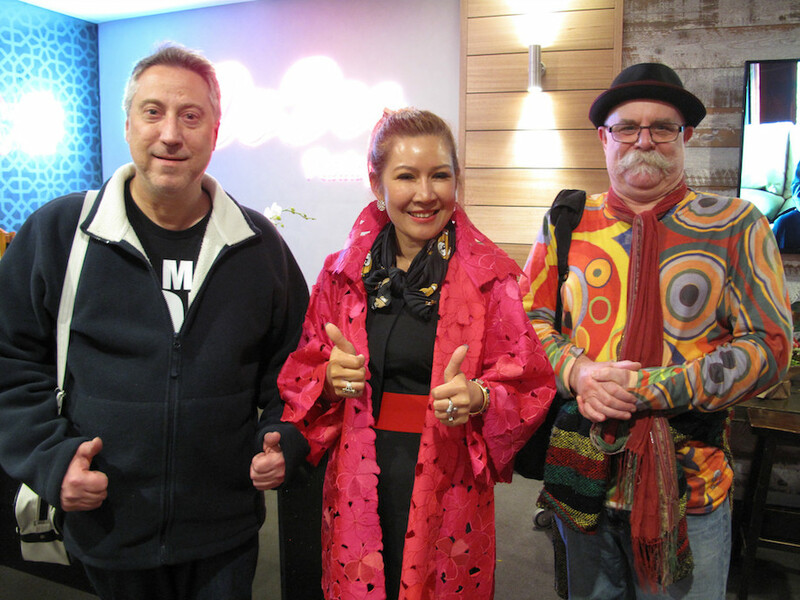 Nat Stockley and CTS with Dodee Paidang boss Mon on opening day.